Although the morphology of the parapharyngeal adipose corpus (PAC) has been already described, the clinical interest of its volume and weight in the genesis of obstructive sleep apnea syndrome (OSAS) is still controversial. The volume of the PAC has been determined in OSAS patients but not in a normal population. The aim of our study was to investigate the morphology of the PAC by dissection and MRI in a normal population and to determine if there is a relation between the dimensions and volume of the PAC and the Body Mass Index (BMI). 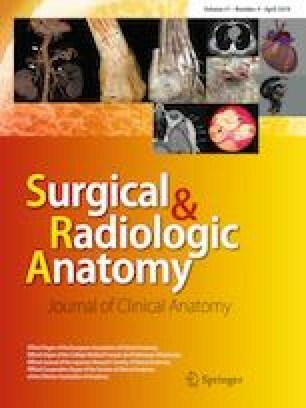 Thirty hemifaces of 15 fresh cadavers have been dissected after silicone injection with dissection of the external carotid artery and its main branches, with harvesting of the PAC. The PAC has been measured and weighed. Twenty-nine MRI of healthy subjects have been examined to determine the volume of the PAC, the palate–pharynx distance, and epiglottis–pharynx distance. In dissection study the weight of the PAC was 18.57 g ± 2.24, the vertical dimension (height) was 4.61 cm ± 0.51, the frontal dimension (width) was 1.62 cm ± 0.24. The blood supply of the PAC constituted of branches coming from the ascending palatal and ascending pharyngeal arteries. The volume of the PAC on the right side was 1.56 cm3 ± 0.38, on the left side 1.54 cm3 ± 0.37. Its horizontal greater dimension was 1.70 cm ± 0.07. There is a correlation between the volume of the PAC and the BMI in a normal population. A surgical resection of the PAC in OSAS patients by transoral robotic-assisted surgery can be proposed with preservation of the ascending palatal and ascending pharyngeal arteries. PN: protocol development, data collection, data analysis, and manuscript writing. JMC: protocol development, data collection and manuscript writing. MPO: protocol development and data collection, PG: protocol development, CV: protocol development, manuscript writing and editing.